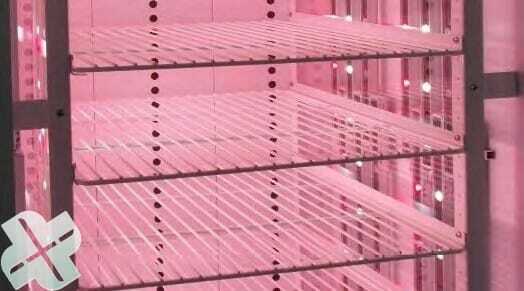 This climate cabinet is developed to conduct germination and growth tests in various climate conditions. 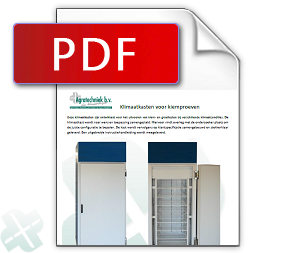 The climate cabinet is assembled as desired and adapted to the application. This consultation will take place with the researcher, to determine the correct configuration. 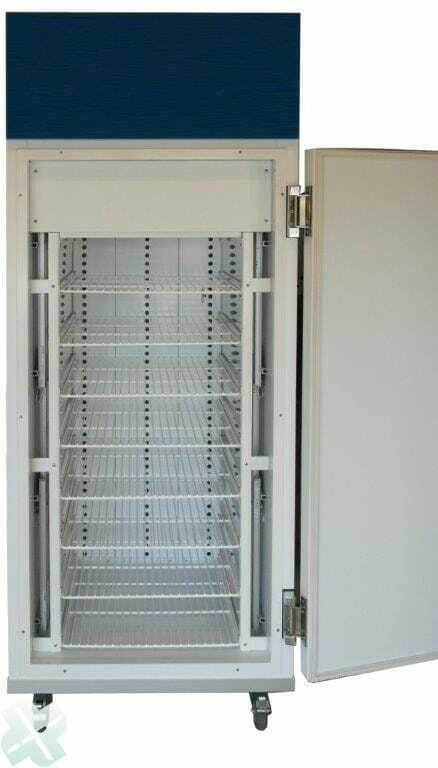 The cabinet is then build to customer specifications and delivered ready for plugging. A detailled instruction guide is included. The process can take place with fixed values (temperature and AH/RH) or through a menu in different steps (stages) at which the temperature, RH/AH and air circulation can be configured as desired. An electrical heating element in combination with a direct expansion cooler will ensure that the desired temperature inside the cabinet is reached and maintained. To maintain a high level of humidity, an ultrasonic humidifier can spread a very fine mist. 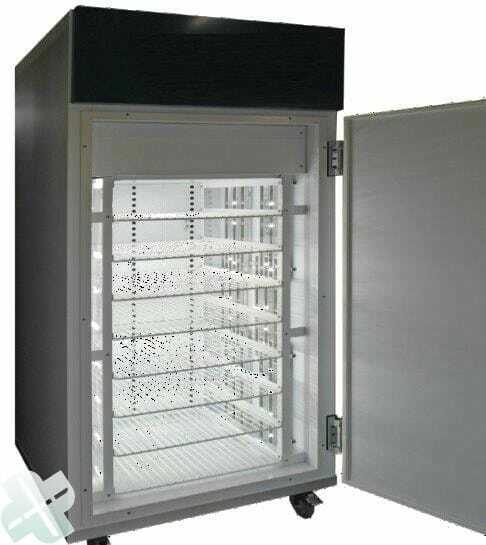 The temperature range of the cabinet can be configured between 2°C and 40°C with the lighting off. The temperature range of the cabinet can be configured between 4°C and 40°C with the lighting on. The RH can be configured between 10% and 85%. Models with a RH until 99% are also possible. For the execution of germination and or growth tests, TLD fixtures can be used. It is also possible to assemble dimmable LED lighting. Optionally consisting of various spectra. In the example below the colors white, red and far-red are separately dimmable to achieve the correct colors. The plants can be illuminated from the two sides of from above. In sideward lighting, the lighting fixtures are assembled on the left and right side of the shelf. This is to prevent the radiant heat from impacting the plant growth. Furthermore there are UV lighting options to carry out health tests on plants. Use the advanced ABC processor to configure and reach every desired air condition (temperature and RH/AH), light intensity and color spectrum on a touch screen. This can be done in various time stages and with or without gradual scale transition; day and night rhythm with dusk and morning glory are an option. The composed menu can be saved as pre-set and used for the next test; 32 pre-sets in total. The entire proces is controlled with the ABC processor which is provided with a touchscreen. One ABC processor/touchscreen can operate several drying cabinets. Use the ABC processor to configure the air circulation, the temperature and the desired moisture content per phase. When a drying menu has been configured, this can be saved as a pre-set. The corresponding menu can be called up again easily. All settings and measurement values can be saved to your pc using the ABC PC Program. These values can be called up again in a graphic or table for analysis. This makes it possible to, if needed or desired, have a tailored adjustment of the processes (Pre-sets). Furthermore there is an SMS Module to send an sms in case of emergencies, and a MCM Module for operation and monitoring (including graphics) from your smartphone or tablet. The ABC guard thermostats will intervene when the temperature in the cabinet becomes too high or too high. All equipment will be shut down to prevent damage, followed by an alarm. After the alarm, an sms message with detailled information can be send to the responsible persons.